Drs. Donald Ross, DDS, David Kim DDS and Neal Shah, DDS, offer Opalescence® at-home teeth whitening at their Atlanta, GA practice. With this treatment, you can dramatically brighten your smile and perform regular touch-ups to maintain your results. At-home teeth whitening is convenient and affordable. It can achieve comparable results to in-office whitening, although it will take a bit longer to see the final effects. With various cosmetic dentistry options to choose from, it is easier than ever to enjoy a sparkling, beautiful smile. After your full whitening regimen, your smile could be dramatically lighter. In turn, this could brighten up your whole face and give you a younger, rejuvenated look. If you choose take-home whitening, Dr. Ross, Dr. Kim or Dr. Shah will provide you with a set of custom-made whitening trays. They will fit comfortably, yet snugly, around your teeth. You will fill the trays with Opalescence® whitening gel, and you will wear them about thirty minutes a day, typically for around two weeks. Alternatively, you could choose an overnight whitening option. The gel will set off an oxidation reaction, and oxygen molecules will penetrate your teeth, breaking apart dental stains. When the treatment is finished, your smile could be several shades lighter. Convenience: At-home whitening is a great option if you have a busy schedule. You can brighten your teeth on your morning commute, while you are cooking dinner, or while you are sitting at your desk. Minimal discomfort: Because of the special formula of Opalescence® gel, the product will not cause significant sensitivity. The gel even comes in three pleasant flavors: mint, melon, and regular. Affordable: At-home whitening can be a good solution if you want to transform your smile, but you are on a budget. 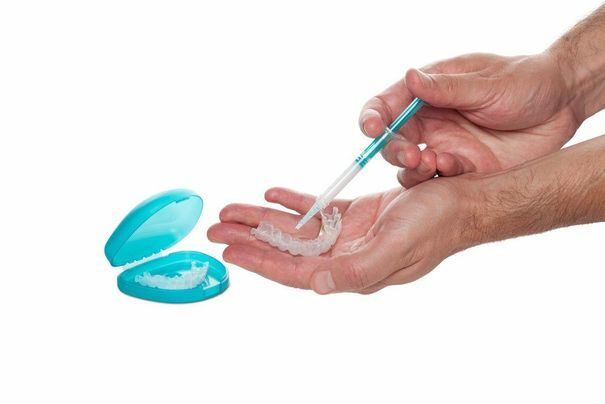 Safe: When used according to your dentist’s instructions, the mild formula of Opalescence® gel will not damage your teeth or gums. After whitening your smile, it is important to take good care of your teeth to reduce future discoloration. First, you should be aware of the primary causes of dental stains. Dark-colored foods and drinks can give your smile a yellowish or brownish tint. Therefore, you should cut back on red wine, coffee, tea, tomato sauce, and similar heavily pigmented foods. Of course, regular brushing, flossing, and dental visits are also important. Finally, you can perform routine touch-ups, using your existing whitening trays. Is At-Home Teeth Whitening Right for You? Both at-home and in-office whitening are appropriate for extrinsic dental stains, such as those resulting from food and drink. Like some patients, you may have internal stains, due to medications, dental infection, or discolored fillings. Teeth whitening cannot address this type of discoloration. However, we offer a full range of cosmetic dentistry procedures, and we can recommend a more appropriate treatment for your needs, such as porcelain veneers. As stated above, at-home teeth whitening involves minimal discomfort. Nevertheless, in-office care may be more appropriate. During Zoom!® teeth whitening, your dentist or dental assistant can closely monitor the process and make sure that the whitening gel does not come in contact with your gums. To learn more about enhancing your smile with safe, convenient Opalescence® at-home teeth whitening, contact our office today.